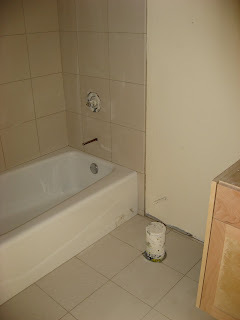 Today brought more tile and more trim...and in both cases, less of it than I had hoped. More of the windows got their sills. This is the guest bedroom, which has two identical windows looking out on the backyard. If our house were a bed and breakfast, this room would be called the Garden Room. I've never had wood windows before. 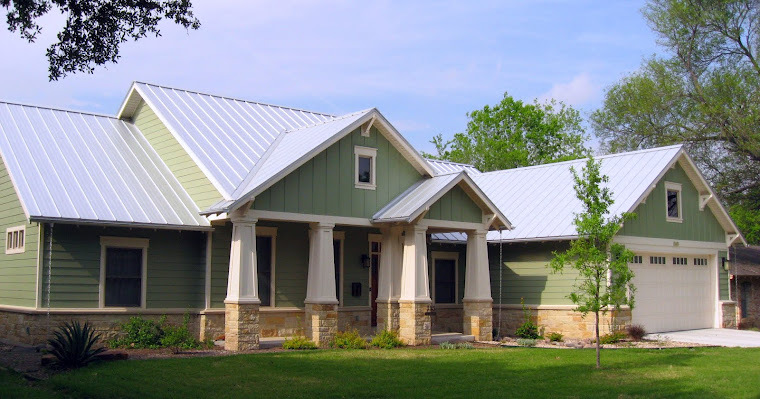 Wood frames are a lot bulkier than vinyl or aluminum -- so much that, when you use them in 2x4 stud walls, there isn't much space left for a sill. That was a bit of a surprise. This handsome little triple window is in the front bedroom, which will be the office. 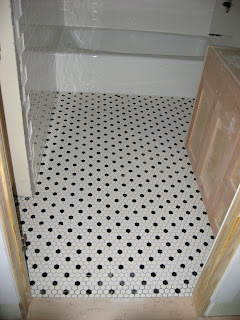 Moving on to tile...here's the mudroom shower floor that went in yesterday. Now it's been grouted. 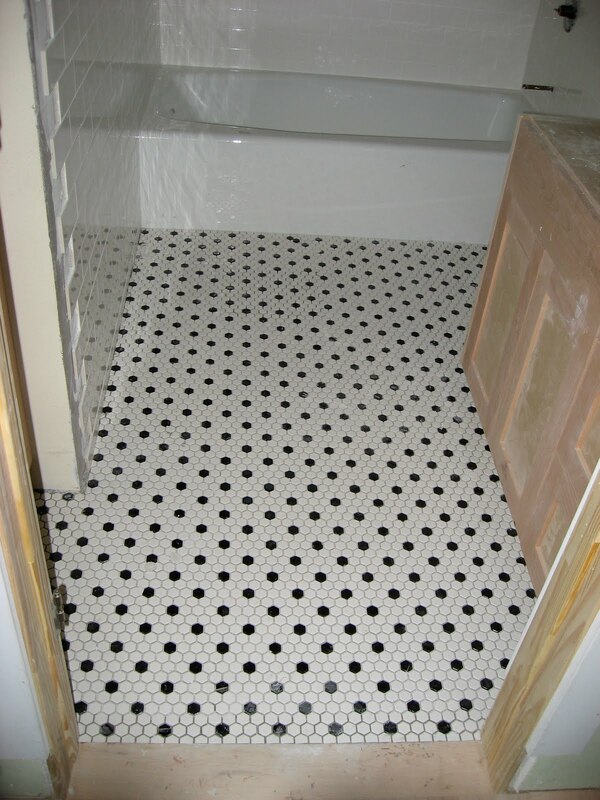 We based the mudroom on our gym shower area, which is tiled in 12"x12" slate, and seeing how they had to cut the shower floor tiles to accommodate the slope down to the drain made us realize that we should use smaller tile for the shower floor. These 2"x2" tiles worked great. The special qualities of this slate don't really come across in these pictures, but trust me, it's really interesting, beautiful tile. At the other end of the "interesting" spectrum is the tile we chose for the back bath. This is the same tile we're using in the master bath, although it will be laid differently there. (We actually found it for the master, and when we ran out of time and options for the back bathroom, we decided to use it there, too.) It looks pretty uninteresting here, but we have colorful granite and a great light fixture picked out, and we're on the lookout for just the right shower curtain to bring some pep to the Garden Room's bathroom. This floor is, in a sense, the oldest part of the house. I bought it last spring, expecting that we would just buy some old house in the same neighborhood and fix it up. (I was so naive.) Lowe's had three boxes (27 square feet) of this wonderful vintage-y hexagon tile for $5 per box (a special order return or something), and I scooped it up. I ended up having to buy a fourth box (at somewhat more than $5), but it was still an incredible value for such lovely tile. The painters were supposed to start tomorrow, but with all the tile and trim work left to be done, I don't think that's going to happen.